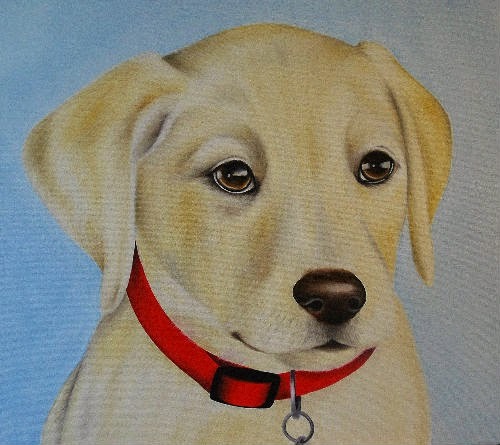 Some of you may remember the beautiful labrador puppy Roxy I painted for Valentines Day, well meet her brother Chunk. The lovely Hiedi who breeds these gorgeous pooches wanted to have a portrait done of Chunk for Mother's Day. As Hiedi lives down in Cornwall I didn't get to meet him which isn't a bad thing as I would have spent hours taking pictures and playing with him like I did for Roxy! 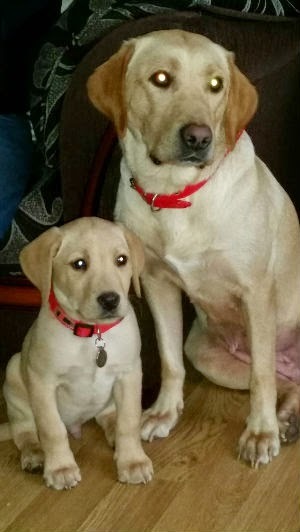 Instead Hiedi sent over lots of pics including this one of him with his Mum. I have to say it's getting harder and harder seeing all these lovely dogs every day and refraining from filling my house with puppys! We decided to go for a head and shoulders portrait on a 16x20 inch canvas which meant I could really focus on his puppy dog brown eyes, now who could say no to that face? !